A HERD of "itchy" cows reportedly caused electricity outages after rubbing their backs on a pylon. The BBC has reported that the power outage for 130 homes in the Welsh village of Gwynfryn last week was caused by the cows scratching themselves against the pylons. A spokeswoman for electricity company ScottishPower told the BBC that the cows appeared to have dislodged power lines, plunging some parts of the village into darkness for up to 16 hours. "Although it is rare, it can happen - a fully grown cow can weigh anywhere between 1000 and 1500 lbs (450-680kg)," the spokeswoman said. "If cattle constantly rub themselves on the same pole then it can dislodge the overhead network. "In areas where we've had problems, we have put up fencing and other obstacles to stop cattle getting too close to the poles. "Our engineers worked as quickly as they could to re-connect power to customers and we apologise for any inconvenience this caused." I read that article yesterday, and wondered exactly what they are calling a "pylon" since none of the news sources had a picture, found out that steel structures are also called electrical pylons. Here in the US, steel structures are usually limited to transmission voltages, dunno about in Scotland. However as an aside, I did find out about the really cool Pylons of Cádiz, a pair of very cool-looking steel structures supporting two 132 kV circuits crossing the bay of Cádiz, Spain. Most likely MV or HV I guess. Don't think I've ever seen steel pylons used for LV distribution. Here in the US, steel structures are usually limited to transmission voltages, dunno about in Scotland. It's the same in the U.K. Steel towers are generally used for long-distance transmission of 132kV and upward, although there are some 66kV lines on steel lattice towers as well. By the way, before hoards of angry Welshmen and Scots descend upon you, I should point out that the place in the report is in Wales, not Scotland! It's kind of confusing, but Scottish Power was involved because it now owns ManWeb, which is the DNO (Distribution Network Operator) which covers north Wales. True for Austria too, but just across the iron curtain I've seen my fair share of 10 or 20kV on steel lattice poles. Railway distribution (15kV 16.7Hz) favors those too, especially in Germany and Switzerland. Austria switched to concrete decades ago, but there are still plenty of old steel poles around. 50Hz distribution seems to use steel poles for 110, 220 and 380kV. Metal poles are getting more popular here as time goes on, even at distribution levels. 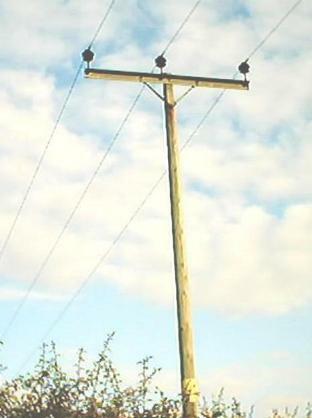 Treated wood poles are not cheap. Back in the 50's, old rail tracks were welded up make a pole for 11kV lines in rural areas, you can see them here, rusting away in our harsh weather conditions. No galvanising, steel cross-arms and pins for the insulators. Now, we have problems with either the welds failing or general corrosion, this was not a good plan. No engineer worth their salt would ever have bare metal out in the elements, but I suppose they were cheap.